AMENEMHAT I - AMENEMHET I - Amen is at the Head - 1991-1962 B.C. Amenemhat I founded the 12th Dynasty. Some Egyptologists believe that recovery from the First Intermediate Period into the Middle Kingdom only really began with his rule. He was probably not of royal blood, at least if he is the same Vizier that functioned under his predecessor, Mentuhotep IV. Perhaps either Mentuhotep IV had no heir, or he was simply a weak leader. This vizier, named Amenemhet, recorded an inscription when Mentuhotep IV sent him to Wadi Hammamt. The inscription records two omens. The first tells us of a gazelle that gave birth to her calf atop the stone that had been chosen for the lid of the King's sarcophagus.Ý the second was of a ferocious rainstorm that, when subsided, disclosed a well 10 cubits square and full of water. Of course that was a very good omen in this barren landscape. 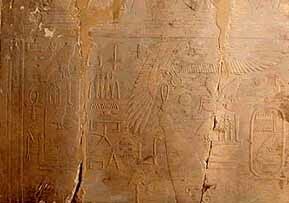 Many Egyptologists believe that Amenemhet's inscription implies that a great ruler will come to the throne of Egypt upon the death of Mentuhotep IV, who will lead the country into prosperity.Ý It is fairly certain that Amenemhet the vizier was predicting his own rise to the throne as Amenemhet I. However, we are told that he had at least two other competitors to the throne. One was called Inyotef, and the other a Segerseni from Nubia. It would appear that he quickly dealt with these obstacles. We believe that he ruled Egypt for almost 30 years. Peter A. Clayton places his reign between the years of 1991 and 1962 BC while the Oxford History of Ancient Egypt gives him a reign lasting from 1985 through 1956 BC. Dodson has his reign lasting from 1994 until 1964 BC. 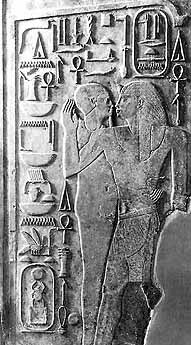 Amenemhet was probably the son of a woman named Nofret (Nefret), from Elephantine near modern Aswan, and a priest called Senusret, according to an inscription at Thebes. So his origins are probably southern Egypt. We know of three possible wives including Neferytotenen (Nefrutoteen, Nefrytatenen), who may have been the mother of Amenemhet I's successor, Senusret I, Dedyet, who was may also have been his sister, and Sobek'neferu, Neferu). It is fairly clear that Amenemhet established Egypt's first co-regency with his son, Senusret I, in about the older kings 20th year of rule. He was not only seeking to assure the succession of his proper heir, but also providing the young prince valuable training under his tutelage. 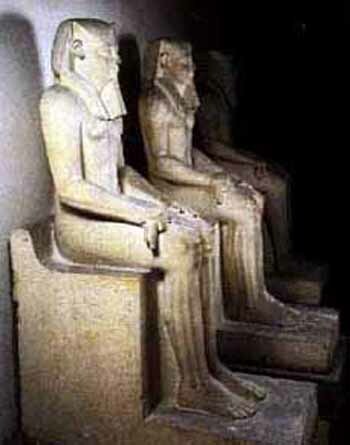 Senusret was given several active roles in Amenemhet I's government, specifically including matters related to the military matters. Several pieces of literature that probably date from his reign, some of which appears to support his reign with fables of kingship. One, the Discourse of Neferty, has a ruler emerging named Ameny, who was foretold by a prophet in the Old Kingdom (Neferty). We do not know what year this literature dates to within Amenemhet I's reign.Ý But while there are other text that refer to the chaos before the arrival of new kings, the references to Asiatics and the Walls-of-the-Ruler are new. His pyramid at el Lisht is instructional, for it seems to portray a return to some of the values of the Old Kingdom, while still embracing the Theban concepts of the region of his birth. Egyptologists who believe Amenemhet I may have waited until his twentieth year to make the move to his new city base their evidence on an inscription found on the foundation blocks of the pyramid's mortuary temple. It records Amenemhet's royal jubilee, and also that year one of a new king had elapsed, suggesting that the pyramid was started very late in the king's reign. Therefore, considerable debate remains over the timing of his move. In Nubia, Amenemhet I first pushed his army southward to Elephantine, where he consolidated his rule and seems to have been satisfied for a number of years. This expedition was apparently lead by Khnemhotpe I, governor of the Oryx nome, who traveled up the Nile with 20 boats.Ý But by year 29 of his rule, the king appears to have no longer been happy with the lose trading and quarrying network with Nubia that we find in the Old Kingdom. In order to protect Egypt and fortify captured territory in Nubia, he founded a fortress at Semna and Quban in the region of the second Nile Cataract, which would begin a string of future 12th Dynasty fortresses. Along with protecting his newly acquired territory and the gold mines in Wadi Allaqi, he also created a stranglehold over economic contacts with Upper Nubia and further south. We also know that he constructed a fortress at Mendes named Rawaty. Amenemhet I took part in a number of building projects. Besides his fortresses, we know he built at Babastis, el-Khatana and Tanis. He undertook important building works at Karnak, from which a few statues and granite naos survive. He may have even established the original temple of Mut to the south of the Temple of Amun. He also worked at Koptos (Coptos), where he partly decorated the temple of Min, at Abydos, where he dedicated a granite altar to Osiris, at Dendera, where he built a granite gateway to Hathor and at Memphis, where he built a temple of Ptah.ÝAlso a little north of Tell el-Dab'a, he apparently began a small mudbrick temple at Ezbet Rushdi, that was later expanded by Senusret III. It is also notable that we find an increase in the mineral wealth of the royal family. We find a huge increase in the jewelry caches found in several 12th Dynasty royal burials. It is obvious from several sources of evidence that even the standard of living form middle class Egyptians was on the increase, though their level of wealth was proportional to their official offices. "It was after supper, when night had fallen, and I had spent an hour of happiness.Ý I was asleep upon my bed, having become weary, and my heart had begun to follow sleep. When weapons of my counsel were wielded, I had become like a snake of the necropolis.Ý As I came to, I awoke to fighting, and found that it was an attack of the bodyguard.Ý If I had quickly taken weapons in my hand, I would have made the wretches retreat with a charge! But there is none mighty in the night, none who can fight alone; no success will come without a helper.Ý Look, my injury happened while I was without you, when the entourage had not yet heard that I would hand over to you when I had not yet sat with you, that I might make counsels for you; for I did not plan it, I did not foresee it, and my heart had not taken thought of the negligence of servants." Apparently, his foresight in creating the co-regency with his son proved successful, for Senusret I succeeded his father and their seems to have been little or no disruption in the administration of the country. Amenemhat I was murdered. His body was buried in his pyramid at el-Lisht, near the Fayum oasis. 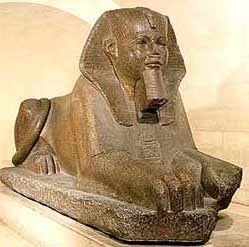 Senusret I was this king's birth name, and means "Man of goddess Wosret". However, it was also the name, we believe, of his non-royal grandfather and so it may give little insight into his character. 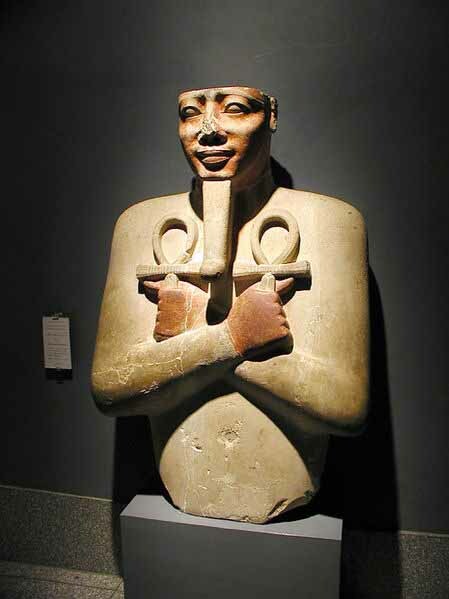 In references, he is also sometimes called Senwosret I, or Sesostris I (Greek). His throne name was Kheper-ka-re, which means, "The Soul of Re comes into Being". 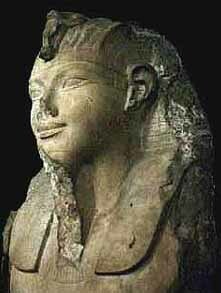 His mother was probably Neferytotenen (Nefrutoteen, Nefrytatenen), one of Amenemhet I's chief wives. He married a Queen Nefru, who was the mother of his successor son, Amenemhet II. 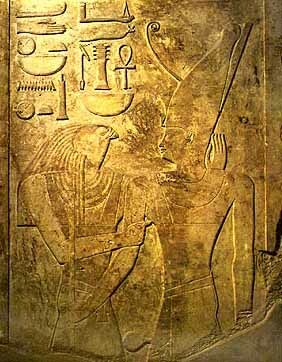 Like his father, Amenemhet II was also made a coregent, but only perhaps three years prior to Senusret I's death. The coregency was recorded by a private stele of Simontu that is now in the British Museum. From her pyramid near her father's we also know that he had a daughter (or possibly a wife) by the name of Itakaiet. He may have had other daughters, including princesses Nefru-Sobek, Nefru-Ptah and Nenseddjedet. Senusret I probably ruled Egypt for a period of about 34 years after his father's death during a period in Egypt's history where literature and craftsmanship was at its peek. We believe he may have been a co-regent of his father far perhaps another ten years. He probably ruled Egypt from about 1956 through 1911 BC. It was a period of affluence, and a remarkable time for mineral wealth, gold and the fine jewelry produced with this abundance. Jewelry masterpieces have been found, particularly in the tombs of the royal ladies at Dahshur and Lahun, attributable to his reign. Considerable efforts were made to procure amethyst, turquoise, copper and gniess for both jewelry and sculptures. But it was also a time of great stability and development. However, we also learn from letters of an old farmer named Hekanakhte to his family, that there was apparently a famine during the time of Senusret, a fact that is also implied by an inscription in the tomb of a nomarch (governor) named Amenemhat at Beni Hassan. But along with this news, we also are provided considerable insight into the life of the common Egyptians of this period by Hekanakhte's letters, and a better understanding of the details of agricultural. He continued many of his father's policies, including the expansion in northern Nubia. We know that he sent one expedition to Nubia in his tenth year of reign, and that eight years later, he sent another army as far south as the second cataract. His general, Mentuhotep, went even deeper into Nubia. 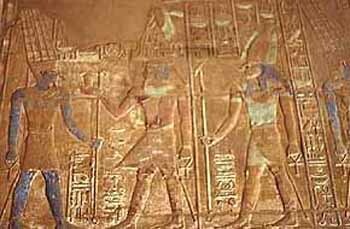 However, Senusret I established Egypt's southern border at the fortress of Buhen near the second cataract, where he placed a garrison and a victory stele, thereby adding to the already substantial military presence established by his father. Now, there were at least 13 fortresses that extended as far as the Second Cataract, and while Egypt's border may have been at the Nile's second cataract, he exercised control of Nubia as far as the Third Cataract. Inscriptions attributable to Senusret I can be found as far south as the island of Argo, north of modern Dongola. He also protected the Delta region and the Western desert Oases from Libyan invasion by means of a series of military campaigns and by establishing control over oases in the Libyan Desert. Several of the expeditions also appear to have been lead by him personally. However, he radically changed the policy towards Syria/Palestine by seeking stable commercial and diplomatic relations rather then a policy of expansion and control.Trading caravans passed between Syria and Egypt exchanging cedar and ivory for Egyptian goods. Religiously, Senusret contributed considerable attention to the cult of Osiris, and over his long rule, this deity's beliefs and practices flourished in Egypt. Osiris was a god of the people and in expanding this cult, Senusret I gave his subjects what John Wilson has described as the 'democratization of the afterlife'. 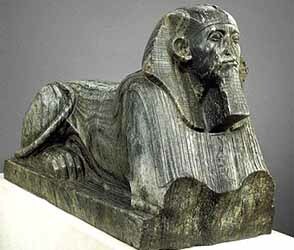 Senusret I had already established himself as a builder during the co-regency with his father by extending and and embellishing some major temples, particularly at Karnak, where he is considered to have founded the temple of Ipet sut (Karnak), and Heliopolis. As early as year two of his reign, he rebuilt the very important temple of Re-Atum at Heliopolis, a center of the sun cult. He probably even personally participated in the foundation ceremonies for the temple's reconstruction. He also had two, massive 20 meter (66 foot) red granite obelisks erected at the same temple on the occasion of his jubilee celebrating his 30th year in office. These monoliths would have weighed 121 tons each. One of the pair remains the oldest standing obelisk in Egypt. He also built the famous bark shrine, or White Chapel, that has been reconstructed by Henri Chevrier in the Open Air Museum at Karnak. It was built in order to celebrate his sed festival (Jubilee) in the 30th year of his reign, but the blocks for the temple were reused to build the third Pylon at Karnak. A scene within the White Chapel records the coronation of Senusret I, and is the oldest such scene so far discovered. The more important projects included remodeling the temple of Khenti-amentiu-Osiris at Abydos. He also erected many memorial stele and small shrines, or cenotaphs, at Abydos, a practice that would be followed by many Middle and New Kingdom pharaohs. 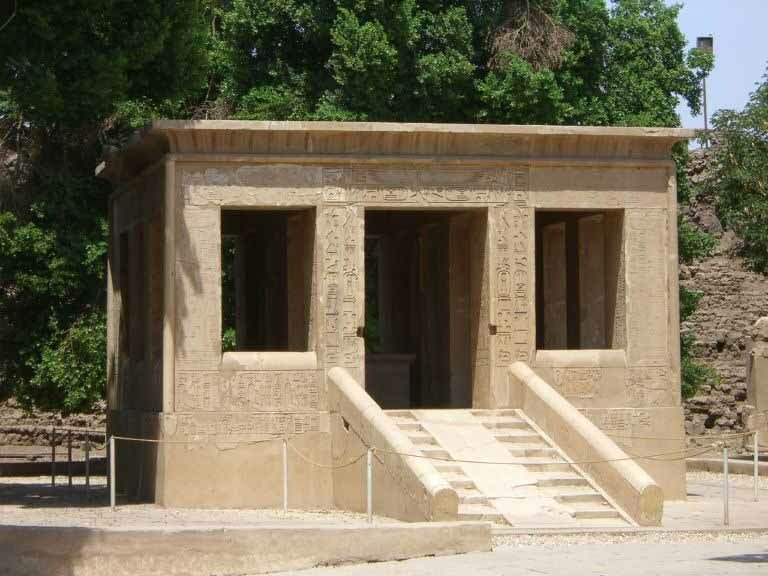 We also find temples built by Sunusret I at Elepantine and Tod. In fact, he is attested to at almost three dozen sites from Alexandria to Aswan and down into Nubia where he carried out building projects. Senusret I also set up a program to build monuments in each of the main cult sites all over Egypt. This was really an extension of an Old Kingdom policy, but in reality he was following his fathers efforts to consolidate and centralize power. This move undermined the power bases of local temples and priests. In order to facilitate these building projects, he sent expeditions to exploit the stone quarries of Wadi Hammamat, the Sinai at Serabit el-Khadim, Hatnub, where two expeditions were sent in years 23 and 31 of his reign for alabaster, and Wadi el Hudi. One of these expeditions extracted enough stone to make sixty sphinxes and 150 statues. Many of his statues did not survive the ages, but the Egyptian Antiquity Museum includes a large collection of those that did. He also built a large pyramid, very reminiscent of older complexes, at Lisht, near Itjtawy, the capital apparently founded by his father. His pyramid is located just to the south of his father's pyramid at el-Lisht.